Every season I like to buy a few new items to integrate into my existing wardrobe. This spring season I purchased a lot of new jeans and pants (mostly for comfort reasons), some cute floral tops, a couple of cardigans, and new shoes. Now I'm done shopping until summer. 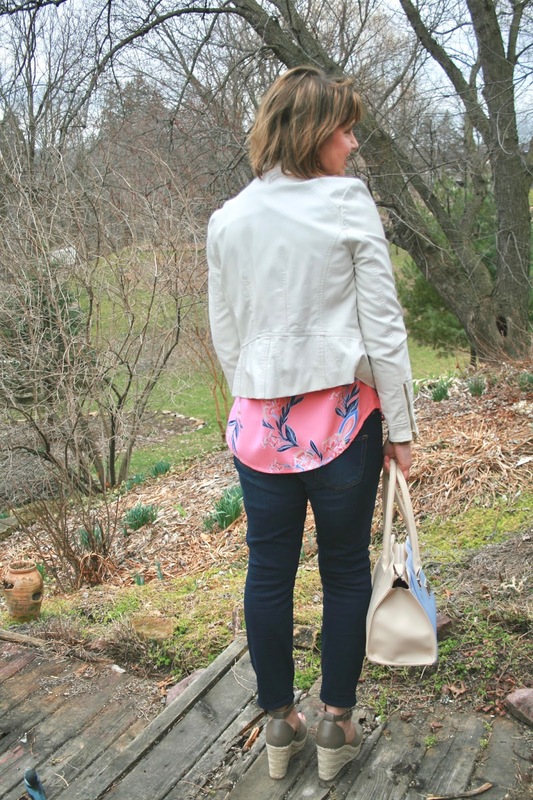 Today I'm featuring one of my new spring tops, new jeans, and sandals. It was cool and windy the day we took these pictures so I added a white faux leather jacket (old, Wilson Leather). The top is from St. John's Bay. It has a perforated V-Neckline, a curved hemline with a nice length, and a loose fit in the stomach area (my personal favorite). It's available in six colors too. I paired my top with a.n.a skinny jeans because I was picking out the dark blue in the top. But after seeing these pictures, I think the denim is too dark for the top and I'd like to try it with white jeans. What do you think? How else do you think I should style this top? The wind kept blowing up and under my top making me look like I was pregnant. I had to hold my top down or wait to photograph in between wind gusts. Here is a detail shot of the perforated neckline and jewelry. I chose to keep it very simple since there was already so much going on in the top. 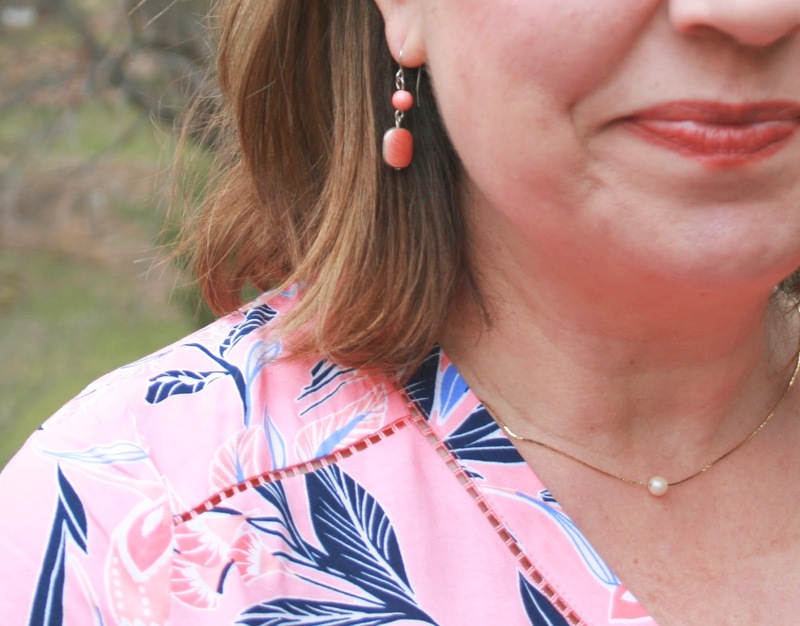 I chose coral drop earrings, a simple singular pearl necklace, and a gold bracelet. The periwinkle blue color in my bag went perfectly with the periwinkle blue in the top! So have you made any new spring clothing pieces this season? What did you buy? I'd love to hear from you! Another lovely spring look my friend! I have purchased quite a few new things to take on vacation. As for another look for that top, how about your grey jeans? Good to know I'm not the only one who buys a whole new wardrobe right before I leave for vacation. :) No, seriously, if I don't buy new clothes then all my vacation photos look the same because I'm wearing the same thing. My husband has the same Wisconsin Badgers shirt on in every vacation photo we have (he loves to wear his local sports team to create conversations). I didn't think about the grey jeans. That's a great idea! I wore this shirt with my very light light pastel blue jeans the other day and liked that look much better. Thanks Stacey! I'm glad to know I'm not alone! You're so lucky to get all those vouchers. I was going to suggest pale wash jeans but you're already there! I would like to buy some of those for summer, and some fresh floral tops and skirts too, but I usually can't find florals I like, get distracted and end up with something completely different. I bought my khaki utility jacket though which I'm really happy with. Hope Karen bought layers for her trip, it's pretty warm there this weekend. yes, I know! There is no way I could buy the amount of clothes I do without them. I've purchased so many florals this season. I just saw on FB that Karen landed safely but had to deal with a very long immigration line. I can't wait till she starts posting pictures! You could wear so much with this Amy. White, Blue, and even Mauve will look good. In the colder months a turtle neck will look good under it too. I often get more wear out of my summer tops that way. Thanks so much, those are great ideas. I think I will do another fashion post next month showing all the other ways women suggested to wear this top. That should be fun! Thanks Elli! I rarely go to Target so I'm not sure what they have. Maybe I'll see what's new on on-line! You look so pretty and ready for spring! I have to make a trip soon to find these sandals, as everywhere I have looked on-line doesn't have my size. :( I like the dark blue jeans with this top and think it picks up the blue in the top. However, white will definitely look great with this, too. Thanks for linking up and have a wonderful week, Amy! Thank you! Oh, these sandals are so popular, I hope you can find them in your size. What a pretty top! I love the pink color and the floral pattern! Looks so pretty with that blue purse! Thank you so much for sharing this fun spring look with us at On Mondays We Link-Up...we love having you!! You look fabulous, Amy! That top is a perfect fit for Spring + those shoes are shoes love! That's such a pretty top! I love the color and the floral. You look beautiful and totally ready for Spring! That pink floral top is so pretty on you! Such a cute spring look and I'm loving your wedges! Chicago, Illinois: The Magnificent Mile.